last saturday a friend of mine showed me his Non Serviam, Unisound press, and it turned out that the artwork and the CD are completely different from mine. P.S. Mine has the matrix code shown on Discogs for the first press, but there they show the cover from my friend's CD. Hail the masses, ugly and dumb! Last edited by Theomachus on Fri Jul 20, 2012 3:00 pm, edited 1 time in total. No idea. So your copy is that dark? Mine is much more lighter and the matrix matches to discogs too. Bootleg? Unisound was notorious for ripping off and bootlegging bands. Yep, mine looks that dark. The weird thing here is that this CD was released by Unisound, so it would be really weird if they bootleged themselves, unless they had already sold the rights to someone else. I bought my copy last year from a friend who didn't need it anymore since he had gotten the original vinyl. I have no reason to doubt that the copy that I got is original. I'd like to help you here, but the images of your copy do not appear here. Could you provide some links? Haven't seen that version before but just taking a wild guess it is like the Uncanny album and a later pressing. Hmm, I think I saw your version on eBay once or twice. It seems legit so maybe it's just an alternative version? Then again that is not something that Unisound would do. Even if it is a bootleg, it looks like a pretty well-done one. Could you scan the disc itself? Does it look like a normal Unisound one from that era? can you upload actual photos and maybe even scans? The version with the band photo on the back is definitely the first press. So are you thinking that maybe the OP's version is a repress no one knows about? I have both versions (both in my collection since middle of the 90s), the interesting thing is, that both CDs look 100% identical, Matrix code, font of matrix code also, both don't have IFPI numbers. As the album has been released in 1994 and IFPI numbers became standard in 1995 I would assume that there has been only one CD press and for whatever reason (some lost/stolen/damaged artwork or initially there have been more CDs that printed covers it has been decided to re-print a certain amount of booklets and tray cards with the different artwork). Also maybe Unisound had more CD copies produced than agreed with the band and had the other artwork printed separately which would mean both are firstpresses but maybe one version has not been authorized by the band. But thats all speculation. What makes me think that my version was printed later is that the CD, even though it sports the same Matrix without IFPI, is differently printed, since the logo on the CD is red (the version with the band's photo is all in black). Plus, they sport different addresses: the version with the band's photo has what it seems like a home address, but my version shows a PO Box. Now, could it be that one version was meant for overseas market and another for local one? I ask this because the version with the band's photo says "Unisound International", but my version just shows "Unisound Records". 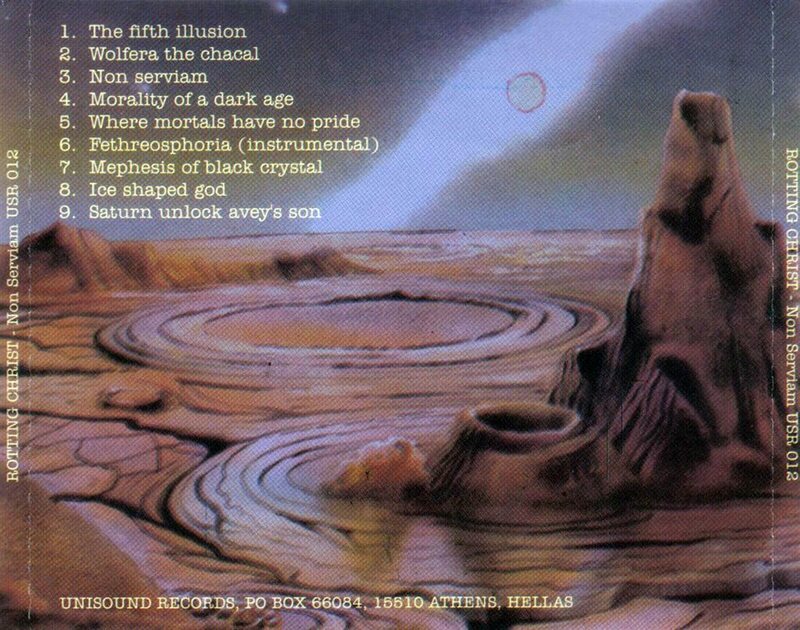 Update: the address shown on the band's photo version is the same that appears on the Passage to Arcturo CD from 95. The first picture release was given free with the Forest magazine (Greece) in 2002 and the second picture is the original press. Same thing happened with Varathron's Walpurgisnacht and Nergal's The Wizard of Nerath. Unisound also made two different versions of the Uncanny - Splenium cd...One has lyrics in the booklet and the frontcover artwork printed on the cd too, and the other one has a less information in the booklet and just the Uncanny logo printed on the labelside of the cd (They also made a much later repress, but that one is very easy to spot: white disc, email dress). The point is that Unisound likely made two different versions, probably a first press and a second press. Yup. I bought my copy as soon as i found out about the release as i worshipped the band's fullength debut. Great artwork. and a T-shirt with the Non Serviam cover;i believe i saw it once as a bootleg for sale at a mailorder. 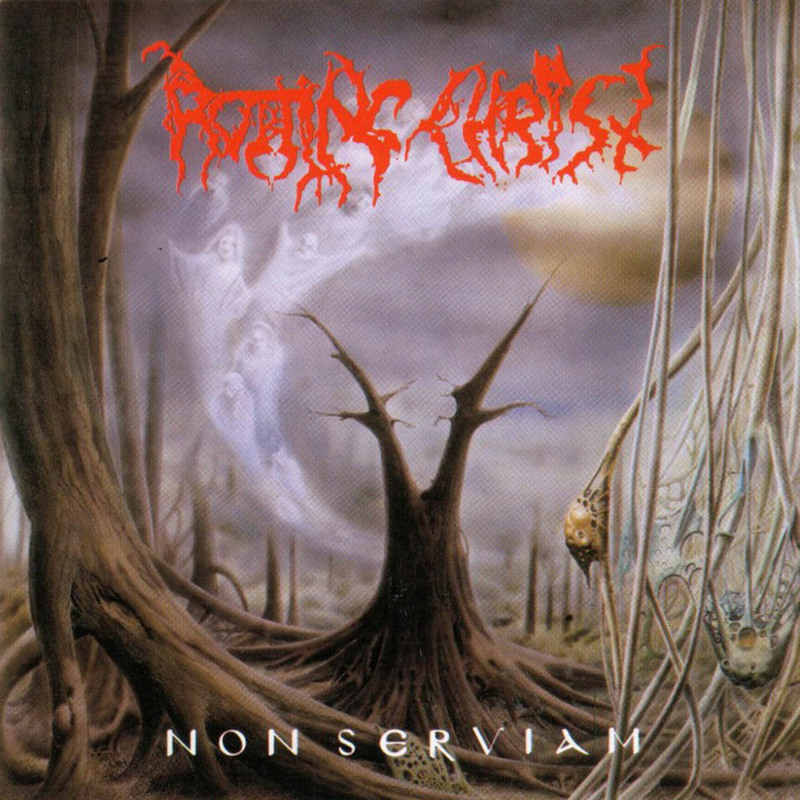 Oh how i wish Rotting Christ's music,AND album covers by the way,were still as genius as their first albums.